The campus was awarded a National Leadership Grant of $615,175 from the Institute of Museum and Library Services (IMLS)--the primary source of federal funds for the nation's museums and libraries. The grant will enable the UCSC Library to digitize materials from its Grateful Dead Archive and make them available in a unique and cutting-edge web site titled, "The Virtual Terrapin Station." UCSC is one of 51 institutions nationwide that received National Leadership Grants this year totaling nearly $18 million. Projects funded by the IMLS are designed to "advance the ability of museums and libraries to preserve culture, heritage, and knowledge while enhancing learning." "We are honored to be among a select group of libraries and museums chosen as recipients of National Leadership Grants," said UCSC Librarian Virginia Steel. "This is a first for the UCSC Library, and the grant gives us the opportunity to create a new model for web-based archives that will include traditional materials from our Grateful Dead Archive--along with materials contributed by scholars and Deadheads around the world." The web site will provide access to Grateful Dead Archive materials, as well as tools to facilitate public contributions to the archive. Steel noted that the Library will develop a click-through permissions form for content contributors that will help extend the reach of the Grateful Dead Archive to the academic research community. 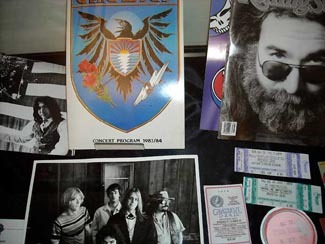 The Grateful Dead donated their extensive band archive to UC Santa Cruz in 2008. It represents one of the most significant popular culture collections of the 20th Century and documents the band's remarkable creative activity and influence in contemporary music history. The archive includes materials related to the phenomena of the Deadheads, the band's extensive social network of devoted fans, and the Grateful Dead's highly unusual and successful musical business ventures.